Water consumption worldwide is on the steepest of hockey stick curves—since 1950, annual consumption has tripled, and in 2006 passed 4,300 km3… that’s about 30% of the available supply of renewable water. Water consumption is expanding considerably faster than population growth—more than double the rate—and much of that growth is due to irrigation. Numbers like that mean that most regions, and especially densely populated areas, are thinking and planning seriously when it comes to water supply and water networks. Fortunately, water management is an area where technology can really help and there really is a lot of ‘low hanging fruit’ to be found. For example, some experts estimate that up to 30% of irrigation water is wasted due to evaporation and over-irrigation. Network management is another area where major gains can be realized. One way to show this is to compare the NRW (non-revenue water) rates of developed and developing countries. NRW is roughly equivalent to wasted water; it’s made up primarily of leaks, theft, and poor metering. In developing countries, NRW percentages average about 35% and in more developed regions the figure is more like 15% with considerable local variance—in Rome, for example, the figure is about 25%. The difference is due largely to better maintenance and better information in developed areas. Better-maintained and informed networks can track down and repair leaks more efficiently, can manage pressure for optimal balance throughout a distribution system, and can implement automatic scheduling and work order systems that address maintenance challenges proactively. 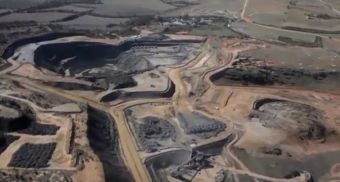 This suggests that developing countries can move quickly to provide more water to end users by simply managing current infrastructure more efficiently. And for developed countries with more mature water infrastructure, that 15% NRW loss is a large and tempting resource to be exploited with more sophisticated technology. Let’s take a look at some of the major technological initiatives in water system management. SCADA (supervisory control and data acquisition) is something of a catchall term applied to a broad range of industrial processes. In its simplest form, SCADA puts sensors (such as flowmeters in water networks) into complex systems like water networks (and also manufacturing lines, gas and oil pipelines, chemical plants, etc.) so that operators have information to work with when making decisions. But SCADA quickly ramps up in sophistication compared to simple sensing capacity. It’s quite common for water networks to have, for example: remotely readable sensors that transmit realtime information via WiFi; remotely operable valves and other controls; algorithmic control processes that respond automatically to changing conditions; realtime information and control data may be used to update sophisticated hydraulic network models. You could, in other words, slap a few flowmeters into a network and call it SCADA data, but you would be barely tapping the potential of SCADA to optimize water distribution. The old way of reading a large system meter involves sending a person into a vault to write down the numbers. The value of getting this data transmitted via a sensor network includes reduced manpower, consistent readings, and added responsiveness. 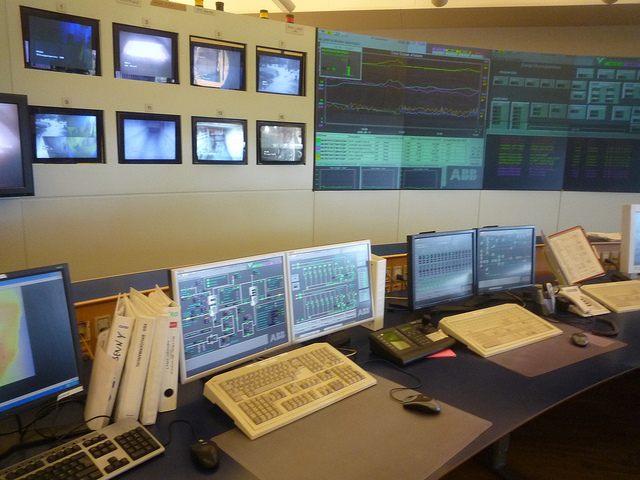 The leading edge of SCADA resembles science fiction of the 1950s, with huge control rooms, lots of screens and blinking lights, ruggedized and redundant equipment intended to survive a variety of natural disasters, and software-driven response protocols that can potentially defuse issues before they even come to the attention of human operators. In some systems, reliability over time can even be calculated, and ‘mean time between failures’ is an important measure. The most progressive SCADA systems stream data automatically into GISs that, in turn, automatically plan and schedule maintenance work and issue system alerts in response to complex algorithms. 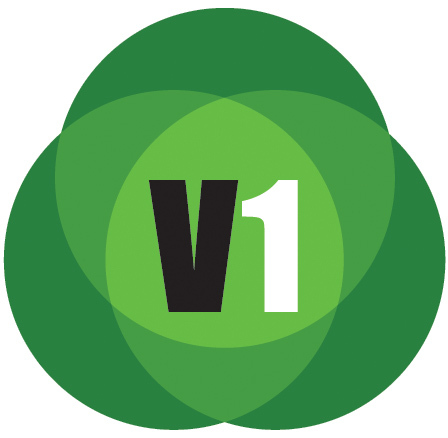 Utilities that make a commitment to this kind of GIS-based network management report significant and measurable efficiency gains and NRW reduction. SCADA has been around for a while, and has progressed from monolithic systems relying on mainframe computers with very little connectivity to today’s systems, which are commonly networked and accessible via the Internet. This is incredibly convenient for operators, of course, but many security researchers are extremely concerned about system vulnerabilities. It’s common, for example, for operators to rely on ‘security through obscurity’ and to not implement truly secure network protocols. Stuxnet, a computer worm discovered in 2010, was specifically designed to attack particular SCADA systems. According to Wikipedia, “The worm initially spreads indiscriminately, but includes a highly specialized malware payload that is designed to target only Siemens supervisory control and data acquisition (SCADA) systems that are configured to control and monitor specific industrial processes.” And serious vulnerabilities remain in place. At a 2011 conference, for example, Tom Parker (CTO at FusionX) publicly used Google to search for RTUs (remote terminal units) and easily found several with associated passwords in the clear; “You can do a Google search with your Web browser and start operating [circuit] breakers, potentially,” he said. It’s a tough problem. Operators need rapid, easy accessibility to data, and continuously updating data streams are necessary for the most valuable SCADA applications. But data distributed indiscriminately is vulnerable to hacking, and systems that are wired for remote controls can potentially be hijacked. Promise and peril, all in one package. SCADA can be considered a base layer, present in most modern water (and wastewater) systems in developed countries. They definitely reduce NRW and allow for much better pressure management and more efficient maintenance schedules. SCADA systems are being augmented with interesting new technology, described below. 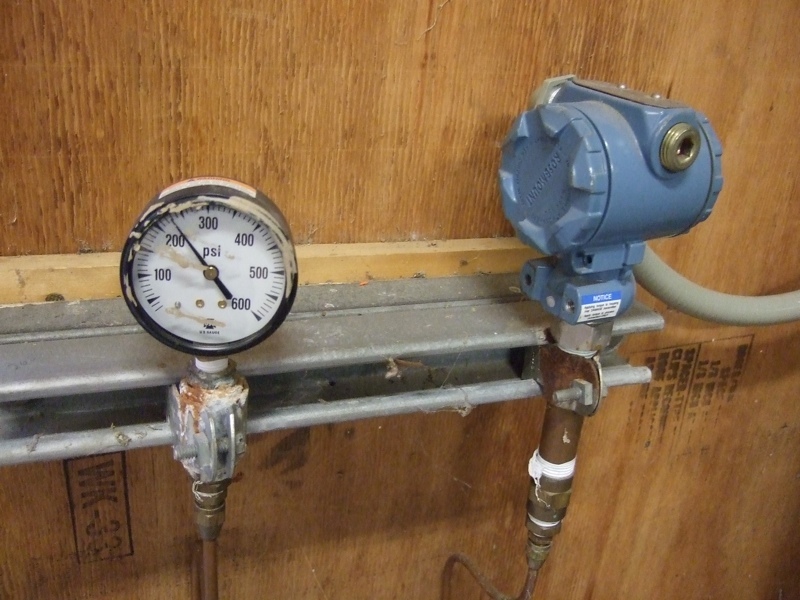 Pressure monitoring tied into SCADA is inexpensive and a good way to keep track of the system. Water companies have always had strong incentives, financial and otherwise to monitor water use closely. Until this decade, the fullest expression of those incentives was AMR (automatic meter reading) systems that eliminated manual meter reading by communicating daily or monthly usage totals to central locations; communication was achieved by various means, including satellite uplinks and radio. More constant measurement and transmittal—as often as every 15 minutes. This moves the management focus from monthly totals to daily usage rates, and allows for rapid detection of catastrophic leaks. The ability for the managing utility to get readings on demand, and to issue commands to the meter that will, for example, cut off or restrict supply. Easy-to-read meters at the consumer’s location. This is more important than might be intuitively obvious, as early studies suggest that customers provided with better usage information tend to spontaneously reduce usage without any other actions being taken. Similar results occur when electric utilities install easy-to-read meters, supporting early water study results. Automatic linking with data collection and processing software that provides sophisticated methods to analyze, interpret, and act on meter data. The best systems can validate, format, and archive the huge amounts of data generated by continual metering, enabling predictive planning due to climate changes, time of year, and other factors. Maintenance and billing personnel should be able to quickly access current meter data, in the field and during conversations with customers. The basic principle behind smart metering (and the other technologies discussed here) is that better measurement almost inevitably results in better management. The possibilities created by smart metering include instant detection of leaks on customer premises, rapid detection of water main leaks, tight location of system leaks, and automatic monitoring of local water restrictions in response to shortages. In some regions, leak detection alone provides sufficient financial incentive for smart meter adoption. In areas that rely on substantial electric pumping, there has been some experimentation with adjusting rates according to peak usage times. Customer response has been mixed, but largely positive. There is certainly resistance to tighter monitoring but, on the other hand, when customers are offered opportunities to sign up for instant leak detection notification (which relies on smart meters) significant percentages respond positively. Conserving water smart metering, and using smart meters to monitor and implement (via remote flow restriction, or cutoff) reduction plans during crisis is largely theoretical at this point, but enormously exciting. In areas like Las Vegas, where shortage is seemingly ever imminent, meter-based flow restriction may emerge as an important—and inevitably controversial—network management tool. 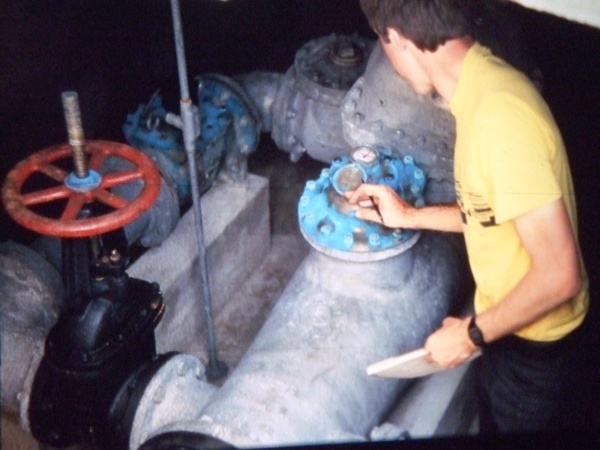 District metered areas, or DMAs, were first introduced in the UK (which operates some of the world’s oldest water infrastructure) in the 1980s. The concept today remains much as defined in UK Report 26, which defined a DMA as a specifically defined area of a network in which quantities flowing in and out can be precisely measured, and which can be isolated by valves. Breaking up a large network into separate, isolatable regions is extremely useful. When in place, trivial flow analysis (especially at night, when usage by customers is presumably low) reveals the locations suffering the most from leaks or poor metering. DMAs are especially useful for detecting and locating slow-but-continual underground leaks and seeps that may otherwise go unaddressed for decades. This in turn enables more intelligent maintenance efforts and the rapid reduction of NRW. 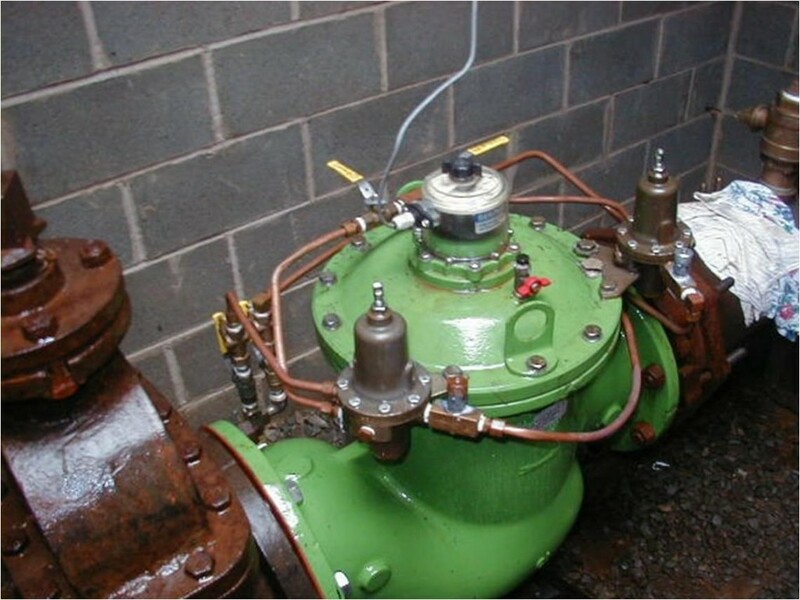 This integrated sensor monitors flow for a District Metered Area (DMA). DMAs seem obvious in retrospect, but their impact has been revolutionary. Compared to smart metering and SCADA systems, implementation of DMAs is relatively cheap and fast, and relatively few flow meters immediately yield big benefits. So they’re something of a ‘base layer’ for network management upgrades; i.e., if a system doesn’t have DMAs implemented, and wants to improve efficiency, they’re a logical place to start. The use of DMAs matures and develops over time. In practice, they have been shown to quickly locate (and thus eliminate) significant chronic leaks and losses in existing systems. With this urgent work accomplished, intelligent use of DMAs can improve maintenance programs and SCADA data, and DMA data effectively leverages investment in hydraulic modeling by providing actual data for calibration. DMAs also measure and provide ROI (return on investment) information, enabling public and private agencies to work more cost-effectively. A hydraulic ‘model’ is not usually a rendered, three-dimensionally accurate virtual representation, as is common for architectural design and structural analysis. Rather, they tend to be more schematic in appearance (somewhat like the famous New York City subway maps) though the information they interpret—pipe sizes and lengths, pressures, elevation differences, flow, etc.—can be satisfyingly complete. Hydraulic models are now routinely used for the design of new water systems and system rehabilitation. But the use of hydraulic models for system management is relatively new and exciting; model-based water network management is emerging as a way to combine, analyze, and use the reams of data created by advances like the DMAs, smart meters, and SCADA systems discussed above. Dr. Tom Walski of Bentley Systems points to one application; “SCADA data is an excellent way to calibrate models so that they become truly useful for the design and operation of particular networks. A lot of our R&D is devoted to this, and there’s a lot of opportunity for applications, especially on the operations side of water suppliers—this is where we’re moving with our modeling.” In other words, a good use of the realtime data generated by SCADA systems is to verify and enrich the assumptions made by models. Walski also suggests that data collected at just a few points in the system—such as flow meters at DMAs—can be enough to ‘fill in’ the rest of the network, so that system managers have a good idea of what’s going on system wide and can more readily address problems and improve performance. Models also offer operators an intuitive graphic interface, which may prove to be a way to reduce training time for new staff. An interesting and fast moving area is the integration of hydraulic models with existing GISs. 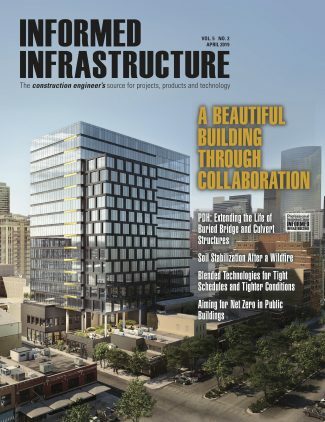 The Esri Press book, Hydraulic Modeling and GIS, by Lori Armstrong, says, “By giving planners and technicians access to more reliable, up-to-date information, integration of a GIS with a hydraulic model allows utilities to get the most from their GIS investment. Integration provides up-to-date information, reduced response time, and accessibility of modeling elements and data to all GIS tools and functionality. GIS should be a major component of any hydraulic modeling effort.” This integration is a good example of maturing technology; bringing together the working methods and formatting requirements of modeling and GIS would have been virtuosic programming a decade ago. Now it’s becoming routine. What’s interesting about the above list of innovations is that none of the technologies described are revolutionary. Sensing, models, smart meter technology, and DMAs have all been around for a while. But the furious pace of data integration and mutually beneficial adaptations for water system use is potentially revolutionary. Reducing NRW by just a few percent can make a huge difference to bottom lines, and can head off economically crippling water shortages. It’s good to see mature technologies working together to accomplish real change, right now.